The Inca civilization flourished in the Andes mountains of South America during the A . D . 1400S and early 1500s. At the center of Inca religion and mythology was the worship of the sun, believed to be the ancestral father of the Inca people. For this reason, sun worship was closely linked to ancestor worship, and many of the myths of the Incas focus on their origins. The Incas tailored their mythology to glorify their own culture and to reinforce the idea that they were a superior people destined to rule others. Based in the city of Cuzco in what is now Peru, the Incas were one of many small groups who lived in the Andes mountains in the 1300s. Gradually, the Incas expanded and absorbed the surrounding peoples, peacefully at first and later by conquest. In 1438 a strong leader named Pachacuti became their king. He and his descendants made the Inca state into a vast empire that stretched from southern Colombia south into Chile and covered much of modern Bolivia and part of Argentina. Throughout this great empire the Incas built a network of roads as well as temples, fortresses, and other public buildings. As the empire grew, the Incas absorbed the myths and legends of the cultures they conquered. They often reworked the old stories of others to give them a new, pro-Inca twist. Although they allowed their subjects to continue to worship their own gods, they expected everyone in the empire to participate in the state religion and to worship the Inca deities. The Incas had no written language so they did not record their myths in writing. Instead, a class of professional storytellers and performers recited the official state history, which contained both fact and myth. Much of what we know about Inca mythology comes from the writings of Inca Garcilaso de la Vega (1539-1616), the son of a Spanish conquistador and an Inca princess. He learned the Inca legends from his uncles, who were members of the nobility. Moving to Spain as an adult, Garcilaso turned his early notes on Inca history and culture into The Royal Commentaries of the Inca. Although European and Christian influences may have affected his accounts, they provide a window into the Inca world in which Garcilaso was raised. In 1531 the Incas came under attack by Spanish conquistadors. The following year their empire fell. The Spanish began converting the Indians to Christianity and wiping out pagan traditions and practices. However, some Spanish military and religious personnel recorded what they learned about Inca mythology, as did a few of the newly Christianized and educated Incas. Though somewhat colored by European and Christian views and values, these accounts offer a glimpse into the mythology of the Incas' mountain empire. 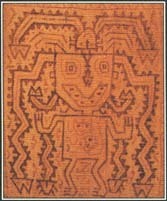 The figure in this Inca textile wears a decorative headdress with a sky dragon. Worship of the sun and sky played a central role in the mythology and religion of the Inca people. 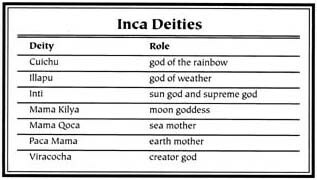 Most of the principal deities of the Inca pantheon represented forces of nature that operate in the sky. The state religion focused on the worship of a few major figures. Gods and Goddesses. The creator god, Viracocha, had many titles, such as Old Man of the Sky and Lord Instructor of the World. Viracocha was believed to have had a special bond with the Inca king Pachacuti, who dreamed that the god helped his people gain victory in a war they were fighting. After winning the war, Pachacuti built a great temple to Viracocha at Cuzco. The temple contained a large solid gold statue of the god as a bearded man. According to Inca tradition, Viracocha had white skin, which explains why some of the Indians at first thought that the bearded, pale-skinned Spanish soldiers were representatives of their creator god. Viracocha, a rather remote and impersonal god, figured less prominently in the daily life of the Incas than did some other deities. Most important of all was Inti, the sun god, regarded as the ancestor of the Incas. He was associated with gold, called "the sweat of the sun," and the Incas honored him with magnificent golden artworks. The Coricancha, or Sun Temple, at Cuzco housed a golden image of Inti that looked like the sun. Facing the image stood the mummified remains of dead emperors, and the walls of the chamber were covered with gold. Inti's wife, the mother of the Incas, was the moon goddess, Mama Kilya. Her shrine in the Coricancha had walls of silver, a metal that was sacred to her because it was believed to be her tears. The Incas marked the passage of time with the phases of the moon. Mama Kilya was thus the driving force of the calendar the Incas used to schedule their rituals and festivals. Illapu, the god of weather who gave the rain, had an important place in a culture that depended on agriculture. The Incas saw the Milky Way, the band of stars that arc across the sky, as a heavenly river. Illapu's sister stored the river's water in a jug until it was needed on the earth. When Illapu struck the jug with a bolt of lightning from his slingshot, making the sound of thunder, he broke the jug and released the rain. Other deities included Cuichu, the rainbow; Paca Mama, the earth mother; and Mama Qoca, the sea mother. Sacred Ceremonies. Inca religious life was administered by a large organized priesthood and centered on honoring ancestors—especially royal ones—as well as the gods. The bodies of dead kings and queens were mummified, dressed and cared for, and thought to have special powers. Young women called Acllas, "chosen women" or Virgins of the Sun, served both Inti and the king, tending the god's sacred fires and serving as the king's sexual partners. Machu Picchu, located high in the Andes mountains in Peru, was a holy city of the Incas, The site contains the ruins of a temple where the Incas worshiped their sun god. of asking for supernatural guidance, including studying the movements of spiders or the patterns made by leaves. The chief method of divination, though, was the use of oracles, which involved making frequent sacrifices to the gods. Inti, for example, received sacrifices of corn every day. Besides offering food and drink to the gods, the Incas also made animal and human sacrifices. White llamas were often used for animal sacrifices, and young children were particularly prized as human sacrifices. Often they were left to die on high mountaintops, sacred places remote from human life but close to the sky gods. Many Inca myths dealt with the origin of the Inca people. These myths helped support the idea that the gods intended the Incas to be rulers. Other myths dealt with the creation of the world and the arrival of a great flood. Creation. According to one myth, Viracocha's first creation was a dark world inhabited by giants that he had fashioned from stone. These creatures proved disobedient, however, and Viracocha destroyed them. He may have turned them back to stone, or he may have swept them away in a great flood. Once they were gone, Viracocha made a second race, this time forming people from clay. He equipped them with the clothes, languages, songs, skills, and crops of different nations. Before the people spread out and populated the world, Viracocha ordered them to sink into the earth and to reappear on the surface again from lakes, caves, and hilltops. They did so, and each group of people built a shrine at the spot where they emerged. Inca Civilization. According to a legend recorded by Inca Garcilaso de 1a Vega, long ago people were ignorant and brutal, living like wild animals, without clothes or houses. The god Inti, known as Our Father the Sun, felt sorry for them and sent one of his sons and one of his daughters to earth to teach them how to live properly. The son was Manco Capac, whom Inti made the ruler of all the races of people around Lake Titicaca in Bolivia. "I want you to rule these peoples as a father rules his children," Inti told Manco Capac. The god gave his son and daughter instructions about how to find the best place for their court. Starting at Lake Titicaca, they were to visit the villages and look for a place where they could drive a gold stake into the ground with one blow. The site became the location of Cuzco, the capital of the Inca empire. On reaching the earth, Manco Capac and his sister-wife, Mama Ocllo, taught the people the arts of farming and weaving. Manco Capac also showed his people how to make and use weapons so that they could enlarge their kingdom. In this way, the sun god himself set the Inca empire on its road to glory. Later generations honored Manco Capac as the legendary first Inca. The myth establishes some of the rights and customs of the Inca royal class, such as the practice of brothers marrying sisters. It also paints a picture of the ancestral Incas as superior to other people and firmly identifies them as descendants of the sun god. Great Flood . Like many peoples, the Incas had a story about a great flood that wiped out a race of wicked and unruly people. The flood myth says that during ancient times people were cruel and greedy and failed to pay proper attention to the gods. Only in the highlands of the Andes mountains were the people not given over to evil. One day two worthy shepherd brothers there noticed that their llamas were sad and acting strange. The llamas told the brothers that a great flood was coming. The brothers took their families and herds to high caves, and then rain fell for months, drowning the world below. Finally, the sun god Inti appeared again, and the warmth of his smile dried the waters. The families descended to repopulate the world. Legend says that although people now live everywhere on earth, llamas remember the flood and live only in the highlands. Other entries related to Inca mythology are listed at the end of this article. Although the Spanish destroyed the Inca empire, they did not wipe out the Inca people. Their descendants live in the Andean highlands today. Many of them speak Quechua, the Inca language. Andean peoples still believe, as the Incas did, that high mountain peaks are sacred places and make pilgrimages to them to ensure good crops and productive herds. In the same way, people have continued the Inca practice of making offerings to local gods at shrines and holy places scattered across the land that once made up the Inca empire. The Incas left larger monuments in stone as well. Walls from their temples can still be seen in the city of Cuzco. Elsewhere in the former empire stand forts and temples. One of the best-known Inca monuments is the mountaintop complex called Machu Picchu, where the Incas once worshiped their sun god. American explorer Hiram Bingham discovered the ruins of this vast temple and brought them to the notice of the outside world in 1912. 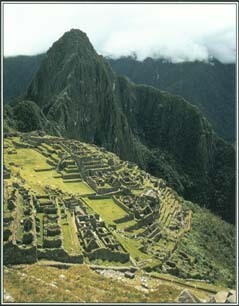 Today Machu Picchu is one of Peru's main tourist attractions. See also Inti ; Manco Capac . Kids left to die, that is taking place now in Uganda thanks to the US using food as a weapon of the Other Wars. The Inka Empire was a phrase coined after the coming of the Conquistadores - pillaging and destroying the main archeoastromical temples- no ruins. The First Andean-Communist multi- State in the hands of Pachakuteq- the one who transforms ( revolutions ) the Earht. no bums, no thefts ( no banks and banksters), no misery, no hunger, in other words no capitalist features- well known nowadays.